I released the proverbial feline from the confines of my satchel the other day, in my post on Macaroni with Cauliflower & Taleggio, when I mentioned that I loved cheese with some stank to it. I was not kidding. So, I am coming clean about one of my food consumption habits of questionable social acceptance. Limburger use to be extremely popular around the turn of the century.... The other century, not the recent one. (which is technically the turn of the millennium) My great-grandpa Wes use to eat it at the Round House in The Dalles all the time. It was so popular back in the 20's that there were multiple manufacturers in the United States producing upwards of 10 million pounds every year; and they could barely keep up with the demand. Sadly, only the Chalet Co-Op of Monroe Wisconsin remains. Though they still make over 800,000 lbs of the stuff every year. So somebody, other than myself, is out there eating it too. First made by Trappist monks in the historical Duchy of Limburg, which now days constitutes parts of the Netherlands, Germany and Belgium, it's name is actually derived from the town of Limburg where is was sold. This washed rind cheese, similar to real Muenster (American versions are much more mild in flavor) or Appenzeller, enjoys extreme popularity in Germany to this day. After the curd is formed, it is salted and placed out on pine boards in the aging room. Then it is washed down with a bacterial solution of brevibacterium linens. (which is also used in making Raclette, Muenster and Port-du-Salut) This goes to work on the cheese curd, turning it from a crumbly acidic chunk of something similar to feta, into a soft creamy unctuous block of deliciousness. Sure is smells. The bacteria used are the same ones that live on the human body and are partially responsible for body odor, but once you move past the smell, (which really isn't THAT bad) the flavor is so unbelievably mild that it's amazing. Now I will warn you, that after the cheese reaches 6 months of age, it's a little to pungent for me as well. My favorite age is between 4 and 5 months. If you have an issue with the smell, you can greatly reduce the aroma by cutting off the rind as soon as you bring it home, and disposing of it in your outside garbage can. Then you should be able to simply keep it in a plastic bag in the refrigerator. Me? I like the rind, so I do what my Great-Grandma Ruby would have done. Once I have opened the wrapper, and released the dogs of war, I simply place it in a sealed Mason jar to contain it's odoriferousness and prevent my refrigerator from smelling like the Chalet Co-Op's aging room. Lay out your slices of Dark Rye Bread (you can use a lighter Rye, but "Dark" Rye or Pumpernickel are the best) and spread with Spicy Brown Mustard. Lay out slices of Sweet Onion on one side. Slice the Limburger, as best you can, cause it can be REALLY soft, and lay them on the other side. Bring both pieces of bread together and there you have it. The Sweet Onion, spicy Mustard and Limburger on hearty dark bread just play so unbelievably well together. But they are topped off by a nice dark German beer such as a Dopplebock. If you will please excuse me, I must return to my Corrupt Canape, my Repugnant Repast, my Fetid Fodder, this most Malodorous of Meals.... Heaven on bread! My kind of cheese and my kind of sandwich! What other kinds of similar cheeses would you recommend? True Muenster Gerome is pretty fragrant, since it's made the same way as Limburger, but I don't think you can get the real stuff in the United States because it's made from unpasteurized milk. There is Stinking Bishop. It's another washed rind cheese using pear juice, made by cictercian monks. "Earth Schmier" from Bleu Mont Dairy is a Havarti-ish type cheese with a washed rind that you can smell from 3 blocks away. Livarot is another good one, though most of the smell is contained in the rind. (like ammonia mixed with smoked pork) The flavor has some meatiness to it, but it's the little bit of a lemon twang that makes it so tasty. Brau Kase is washed in brewer's yeast making it pretty fragrant as well, but it's nice and sticky like a well aged camembert du calvados. 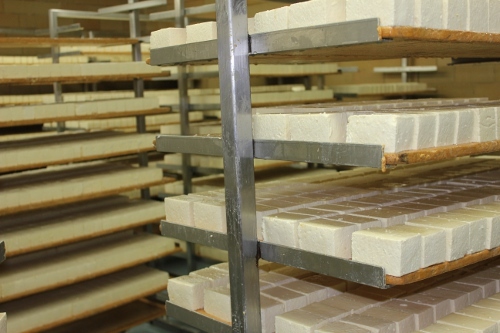 Liederkranz is close to Limburger, but has a butterier flavor. I live in Europe, so I'd better start sleuthing. I've never tried it and bought some today at Brennan's in Madison, WI. Your post is exactly the info I wanted. I'm off to buy some dark rye and proper mustard. Thanks for the post! Onion and mustard? I prefer to slap some Branston "original" pickles on top. Limburger is amazing! I remember the stench from when I was little and Mom made a spread from it. Thought I’d shoot myself before tryimg it. Well Mom is 86 and all she’s talked about is her limburger spread so I made it for her. Omgosh...got it on my fingers and licked it off without thinking. I’m hooked!! It’s wonderful! We’re making your sandwich for lunch tomorrow!! Thanks for the recipe and all the info on Limburger! !